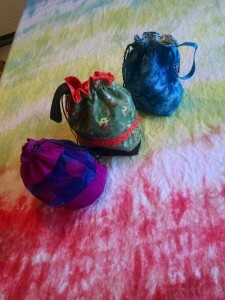 Here are some of the bags made at the Project Bags and Totes workshop. Attendees had a great time sewing and decorating their handbags. On Saturday February 18, 10:00 a.m. – 4:00 p.m., we’ll learn how to Make Project Bags and Totes from handwoven and dyed fabrics. See the attached flyer for details. Event Report: There were more than 80 visitors and members at Roc Day. Thirty-two of the visitors asked to receive the newsletter. Thanks to the five sponsors for door prizes: Cozy Cove Farm, Crochetville, Handmade Saori, Hook-A-Frog and North Alabama Fiber Arts Co-op. Thanks to members who contributed door prizes and brought their equipment to spin, weave, crochet and knit so that the visitors could see what we do. Thanks for bringing drop spindles and fiber so we could show some of the visitors how to spin. When: Saturday January 7, 12:30 p.m. – 5:00 p.m.
Where: Lowe Mill 2nd floor classroom. Roc Day is a community celebration of Fiber Arts. Meet and network with local fiber artists while working on your current spinning, weaving, crocheting, and knitting projects. Find out about local beginning and intermediate classes. All fiber artists, aspiring artists/makers and the public are welcome. Bring your friends, any fiber project to work on, or for show and tell. Door prizes are being provided by sponsors.